An American Werewolf in London is a cult classic comedy horror movie from 1981. 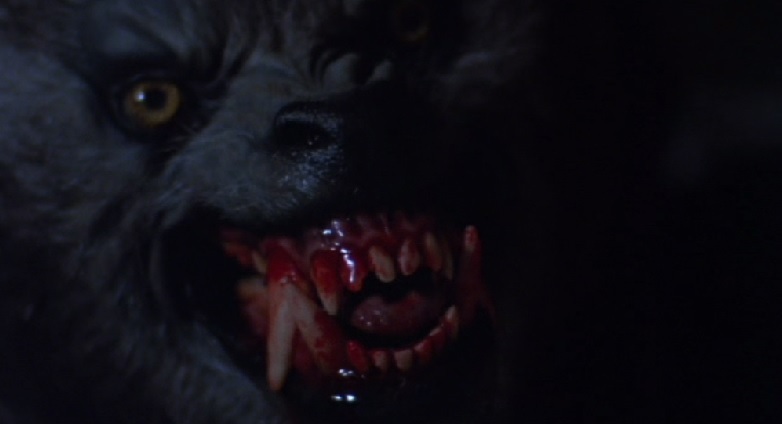 It was directed by John Landis and, at the time of its release, the movie broke new ground by showing the viewer a detailed transformation of a man into a werewolf (the scene took a week to film). There had never been a werewolf movie quite like it. In fact, when Michael Jackson saw the movie he was so impressed he hired Landis to direct his 1983 Thriller video. When they arrive at the small village of East Proctor, the boys decide to go into the local pub and warm themselves for a while. It is a charming little place called The Slaughtered Lamb, where the locals are less than friendly and there is a pentangle painted on the wall. Jack is quick to point out to David a pentangle is the mark of the Wolfman, and he suggests David ask someone about it. David is not keen one the idea. The locals are just beginning to show signs of warming to the two boys when Jack makes the mistake of asking the question himself. Silence falls over the room and a man who was playing darts gets particularly angry: “You made me miss,” he says, pointing a finger at the Americans. Apparently, he has never missed the board before and David and Jack decide it might be prudent for them to leave. “You can’t let them go,” the landlady says. “God be with you,” ads another one of the locals who is playing chess. “Stay on the road, and keep clear of the moors,” the man at the dartboard tells them. “Beware the moon lads,” the chess player warn them. When the boys hear the sound of howling coming from across the moor, they start to get worried. To make matters worse they notice there is a full moon and they have left the road: “Oops!” Suddenly The Slaughtered Lamb doesn’t seem so bad after all and the boys decide to head back. Maybe it would have been better if they had never left there in the first place because seconds later they are attacked. Jack is ripped apart and then the monster decides it wants a piece of David for desert. Fortunately for David, the guys from the pub have had an attack of conscience and come rushing to the rescue, bearing guns. They shoot the beast before it can do much more than inflict a few nasty scratches on David, but perhaps that is more damage than anyone realizes and the American passes out. David wakes up in a hospital bed and finds himself under the gentle administrations of Nurse Alex Price (Jenny Agutter), who is rather easy on the eye, to say the least, and is quite taken with the injured American. David might have survived the attack, but he is not out of the woods yet because he is having bad dreams. In one of his dreams, he is running, naked, through the trees and snacking on live deer. Some of his other dreams are more unusual still and David begins to fear for his sanity. Of course, it doesn’t help matters when his dead friend, Jack, visits him—looking red and runny and with his windpipe displayed—yuk! Jack warns David he will change into a werewolf at the next full moon. “Kill yourself,” he tells him, “before you kill others.” And they used to be such good friends! Things are not all doom and gloom for David because when he is released Alex invites him to stay at her apartment. Being neither blind nor stupid the young man accepts her invitation and waves a glad goodbye to any chance of further bed rest. The full moon is not far away though, David is still having bad dreams, Jack keeps on visiting, and the dead boy looks a little more decomposed every time. When the full moon rises David’s problems really begin. The undead surround me. Have you ever talked to a corpse? It’s Boring! And Jack delivers the word ‘boring’ like the punchline of a joke. The movie does contain a fair amount of blood and gore. At one point a rather annoying police detective’s head is removed from his shoulders with one snap of the werewolf’s powerful fangs. The head then proceeds in an un-orderly fashion to bounce off the bonnet of a police car, where it leaves rather a nasty red stain. 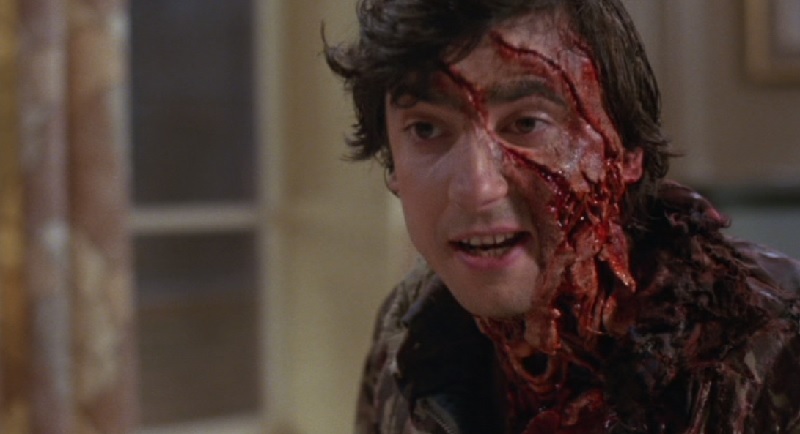 Horror and humour run hand-in-hand throughout An American Werewolf in an even mix. There are plenty of shocks, but just as many laughs and the movie is a particularly fine example of how horror and humour can work very well together. 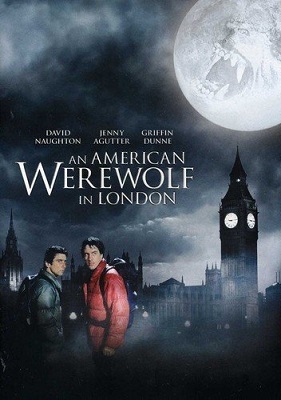 An American Werewolf in London also boasts an excellent soundtrack and the song “Bad Moon Rising”, sung by Creedence Clearwater Survival, will always be one of my favourites. It rocks! So, with a great soundtrack, an excellent cast, script and special effects, and—let’s not forget, a great, big hairy werewolf—what’s not to love about this movie? It’s fantastic.